As with so many cities, Melbourne is alive at night. 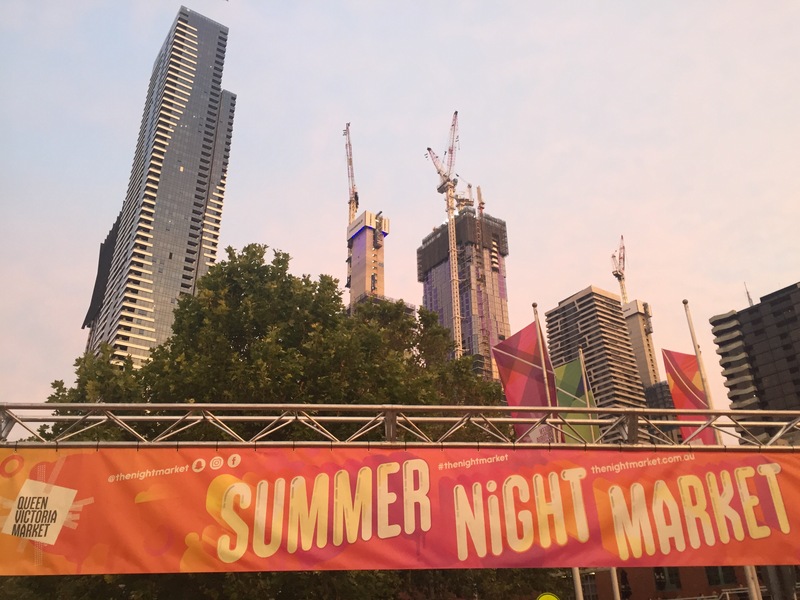 I can’t speak for what it is like in winter (I have been told that Melbourne goes into hibernation) but in summer there seems to be a lot going on! One of my favourite nights of the week is a Wednesday because of the Summer Night Market at Queen Victoria Market. Something Melbourne has a lot of is good food and, particularly, markets that show off this good food! We have seen a few whilst exploring Melbourne (the noodle market being one of them) but this market is my favourite foodie market in town. This place is incredible if you have a love for food (definitely go if you are in Melbourne). It’s only on once a week so gives you time to save up for the next week and gives you plenty of opportunities to try the different types of food. We got the tram to the market and it’s always extra crowded as hundreds flock to grab a plate of food or two from the vast range of stores on offer! The market is enormous with so many amazing dinners from all over the world to great desserts such as churros and waffles. On our second time at the market I got an amazing toasties filled with macaroni cheese, BBQ sauce and caramelised onion (basically a bunch of my favourite things in bread – unreal)! Niall had the same but his had pulled pork in it. We then had waffles for dessert – me and Niall had salted caramel popcorn and sauce in ours, Kathryn had a Rocky Road one and Amy had fruit, nutella and icecream in hers. The market isn’t the cheapest but they’re good sized amounts of food and so delicious! The atmosphere is great here with live music playing throughout the venue and people drinking everything from sangria, beer, cider and pimms. We had a great time here again all splitting off to find food and then relaxing together to people watch and absorb the atmosphere around us. This place always has a range of stores so you can always get massages and henna or buy dream catchers, sauces, clothes and jewellery – there is something for everyone. After the market we headed up to the Eureka Skydeck which is at the top of the tallest building in the city and shows spectacular views. I hope to go back here one day when it’s light (maybe for the sun setting) but it was incredible seeing all of Melbourne lit up as far as you could see. As Melbourne has a coastline it was cool to see the vast amounts of lights fade into black where the sea was and we were all so surprised about how big Melbourne actually was! We were able to spot all the places we had been and was extra cool to see these places lit up as we’d only seen them during the day. It was truly breathtaking and a must if you’re visiting Melbourne, I’m so glad we did it! One evening, when Kathryn got given the next day off work, we decided to go out for drinks to ABC to make the most for her not having to get up at 6am the next day. ABC is a bar lots of people have said for us to go before a night out. It’s the Asian Beer Cafe in Melbourne Central and is a cheaper place to drink than a lot of places in Melbourne (everything is super expensive here!). I love the decor in this place – it’s super stereotypical Asian with Hello Kitty, Astroboy, Asian street signs and Chinese lanterns. It even had Milan playing on the TV screens (a bonus). The best thing about this place is it has a range of cocktails on tap which I think should be a thing in every bar. As well the places that are on offer at night, Australia has cool wildlife when the sun goes down. Even though we are in a city, Melbourne has possums and we saw one of these after being at the cricket one evening – so cute! 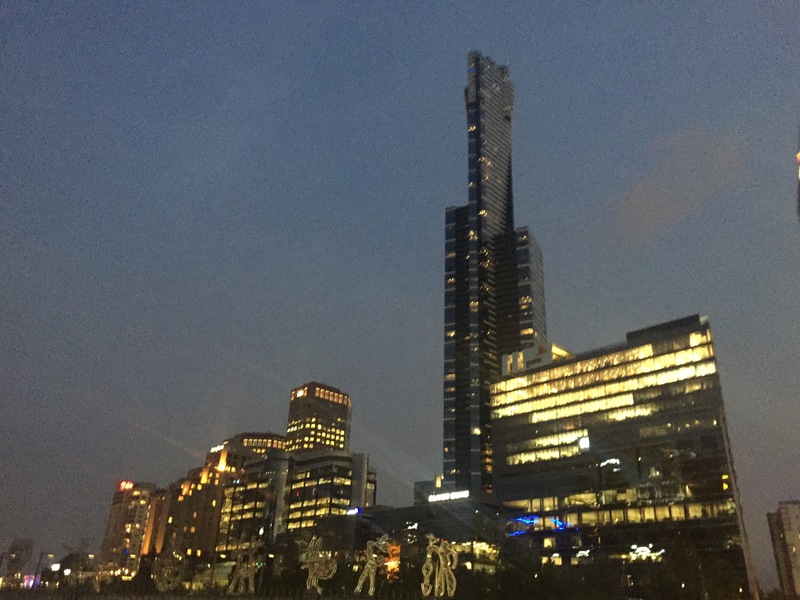 Although this only shows a sample of what Melbourne is like at night, it always interests me how a place can change once the sun starts to go down. From all the lights you can tell it’s not a city that falls asleep and it’s been lovely to see all of the things you can do during the week instead of having to live for the weekend. I feel incredibly safe in Melbourne and look forward to continuing to explore what it has to offer over the next few weeks.